Nitrogen is one of the most vital major nutrients that plants need. Sure, you can get a bag of chemical fertilize and throw that around, but in many cases a natural source is more suited to your needs - especially when growing vegetables. Organic sources are more variable, but also include other micronutrients that your plants require, and in some cases, organic matter which benefits the soil. Bat guano – one of the best sources of Nitrogen, quick to release. Great for using mixed with sawdust or other wood product, as the sawdust will tie up Nitrogen from the soil as the microorganisms get to work. This Nitrogen is released later, as the sawdust decomposes, but in the meantime, without another source of N, your plants will suffer. Advantages: you only need a bit as it’s so concentrated. Cons: not sustainable if the bat caves of Peru and other South American countries are depleted and the bats continue to suffer from white nose syndrome, a fatal fungal infection. Some experts fear that the fungus is spread by humans entering caves that are used by bats. 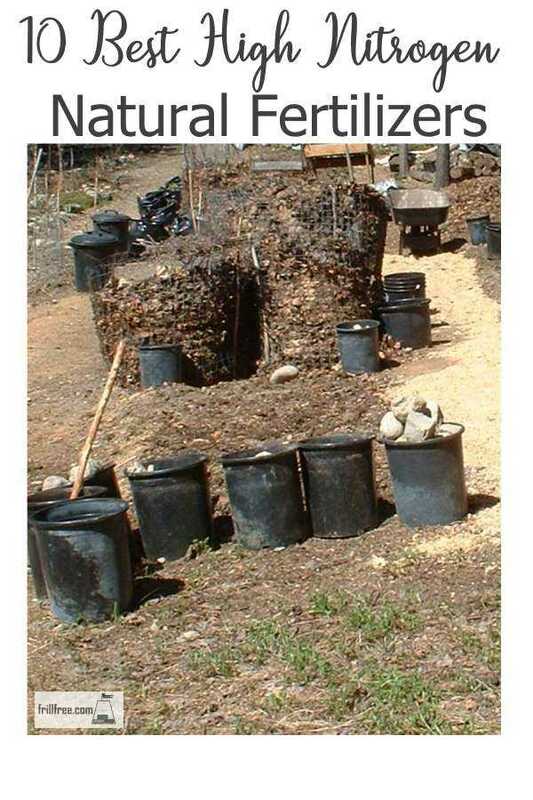 Chicken manure; it's readily obtainable; in fact it can be overproduced if you have a flock of backyard chickens. The springtime when you clean out the chicken coop can produce a lot of valuable chicken manure, which, like bat guano is a rich source of Nitrogen. Used judiciously, composted well with the deep litter of the chicken house, this is one of the absolute best of all high nitrogen fertilizers. Disadvantages: extremely hot in the first stages of decomposition, and can burn tender seedlings with both the heat of decomposition, and the salts that it contains. Use dry as a top dressing, or mix into the soil well before planting to allow the micro herd to start work on processing it. Blood meal is a proven high nitrogen fertilizer. Battle fields are where you can see this particular fertilizer at work. Abattoirs are the source of commercial blood meal. Usually dried and purchased as a dark red powder, this product is generally spread around those crops that require a rich soil, or added to slow compost as an activator. Cons: the smell of blood meal can attract wildlife (like bears) or the neighbor’s dog. Alfalfa pellets – the ultimate legume, chopped and pressed into small pellets has long been used for animal feed. In the organic garden, each little pellet releases the nutrients slowly over a few weeks to months. They act as a natural slow release fertilization program for plants that need an extra boost. Horse manure is one of the best natural fertilizers. The fact that horses only have one stomach makes it impossible for them to completely digest the hay and green fodder, leaving a good percentage of smaller particles that can add valuable organic matter to the soil. A disadvantage of this process is that they also don’t digest seeds of the weeds that they eat, and those germinate and grow wherever fresh horse manure is spread. It’s absolutely imperative to compost horse manure properly (ie: by allowing the heat to build up and kill weed seeds) before use. The only time you don’t need to do this is when using fresh horse manure in compost tea. Compost tea – my favorite brew. I make compost tea with anything available; alfalfa pellets or meal, dried weeds, horse manure, or even compost. Add a couple of shovels full of compost to a nylon stocking, and immerse in a large trash can full of water, stir daily for a week or two and dilute before using. Avoid using compost tea on leafy green crops that you will eat raw, as it can be a source of E. coli or other digestive problems. Cottonseed meal – most commonly used in areas where cotton is grown, as this is another product that really has high embodied energy. Other aspects of using cottonseed meal are that cotton traditionally has been the crop voted most chemically dependent. If you’re concerned about exposure to pesticides this might not be the most suitable natural fertilizer for your organic gardening program. Liquid organic fertilizer – the most useful of all natural fertilizers. Guaranteed that the source will never run dry, and it can be used on most crops with the exception of leafy greens, for a similar reason to compost tea, and also for the ‘yuck’ factor. What is it? Human urine is a high source of urea, which is broken down into nitrogen. Seaweed and kelp are harvested from beaches after a storm, and composted or dried and used as mulch. Harvesting commercially in large quantities is not a sustainable practice, but if you live near the ocean, take a couple of garbage bags with you when you go beach combing. Rinse well to remove the salt before you put it on your garden. Other sources of similarly valuable water weeds are Eurasian Milfoil, dredged from lake bottoms or water hyacinth, a rampant grower in warmer areas. Air – no kidding, you can get nitrogen from the air, as it is gathered by rain and snow falling. Snow is known as the poor farmer’s fertilizer due to this. This list gives you plenty of options for high nitrogen natural fertilizers to use on your organic garden. Choose one or two, and see the results.